Aurora Orchestra, under conductor Nicholas Collon, with HK Gruber's Frankenstein! !, inspired by Mary Shelley's novel, and Beethoven's 5th Symphony, at the Queen Elizabeth Hall. Recorded over the weekend at the Queen Elizabeth Hall in London, Aurora Orchestra perform HK Gruber's Frankenstein! 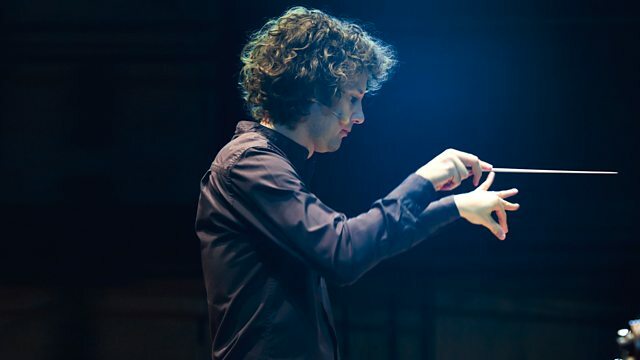 !, inspired by Mary Shelley's novel, and Beethoven's 5th Symphony, played from memory, under the baton of conductor Nicholas Collon. Part of the Orchestral Theatre: Claus Moser Series at the Southbank Centre, this performance takes elements from the early 19th-Century Parisian theatrical genre called phantasmagoria, where optical illusions, ghostly projections and eerie sound effects combine for a terrifying experience. This action develops out of three early romantic masterpieces – Schubert's Der Wanderer , Mary Shelley's Frankenstein, as seen by Austrian contemporary composer HK Gruber, and Beethoven's 5th Symphony. Directed by Jane Mitchell, whose original concept this is, the event also includes surreal narrations by chansonnier Marcus Farnsworth.